Watermen Investments has completed an 8.8k sf boutique office project in the heart of downtown Escondido. The project, located at 704 E. Grand, entailed overhauling an outdated 1970’s building, taking it down to the studs and transforming it into a vibrant, contemporary office space. The property, which features two buildings connected by a courtyard, has been updated with an open, industrial feel that can be customized with any blend of contemporary and traditional office space. Large glass doors and pivoting windows integrate the courtyard with adjoining office space, creating a collaborative indoor and outdoor space. 704 E Grand has also been equipped with new LED lighting, foam roofing, drought tolerant landscaping, new parking, ductless HVAC and a new electrical system, among other features. "Watermen Investments’ projects like 704 E Grand are an exciting addition to Escondido," said Michelle Geller, Economic Development Manager for the City of Escondido. 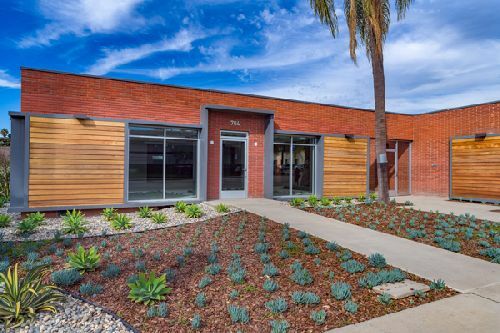 "704 E Grand brings modern office space to downtown Escondido, helping the City attract new businesses, house jobs, and power the local economy." 704 E Grand is currently listed for sale or lease with representation by Chris Williams, Marc Posthumus, and Hank Jenkins of Colliers International San Diego Region. Jake Hicks Construction was the contractor. 704 E Grand is the latest of several projects completed by Watermen Investments in the City of Escondido. Most recently, the firm completed the transformation of longtime vacant bank building located at 355 W Grand into a new, contemporary home for Classical Academy.